A BICSI Registered Telecommunications Project Manager (RTPM) knows how to multitask while meeting strict deadlines and ensuring a quality outcome, and can coordinate and communicate technical elements between designers, installers and end users. 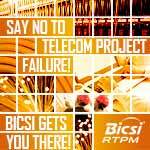 From planning to project completion, count on a BICSI RTPM! Sena Technologies, Inc. has released its new Tufftalk headset, which is engineered with Sena's almost two decades of industrial wireless Bluetooth expertise. Sena's Tufftalk, an earmuff Bluetooth® communication and intercom headset, is designed specifically to meet the communication and connectivity needs of industrial applications. Equipped with HD quality speakers, Tufftalk delivers crystal clear audio that industrial mobile workers need to stay safe on busy and noisy worksites. Telecom Exchange (TEX) "Where Communications and Technology Meet," is an executive-level networking event to be held November 15 in Beverly Hills, CA. Decision makers of service providers, data center/colo operators and vendors will join investors and tech company innovators to network and close business. An award-winning event, it is a neutral playing field designed to drive direct and 'red-tape-free' networking and c-level engagement. A feature presentation entitled, "The Importance of Accurate Network Assessment" will be delivered by Julian Palmer, CTO of Visualware, a private Network Application and Performance Management Assessment Company, based in Turlock, CA. "Is the assessment of connection quality more important than the speed? That's the central question I'll address," said Palmer.